In every sport, country and culture worldwide, it is received wisdom that you play the game best off the front foot. By that, I mean that regardless of whether one is anticipating a forehand down the line, leaning in to defend against the likes of Gronk, or closing a deal you have to be in a position to attack your opponent going forward. If you don’t, the ball, the person, the opportunity will blow by you and have their way. This wisdom applies to pretty much everything in life be it business, damage control, pleasure, sports or warfare. But enough of that and far more important to those who follow the Revolution are depth in defense and the contract questions surrounding Jermaine Jones, Lee Nguyen and, possibly, fresh reinforcements to the team as they move into the middle, warmer and, on past form, most difficult part of the MLS season. A bit of background; after a poor start with bad games against Seattle and the ersatz Citizens of El Bronx, Foxborough’s proper football team has had a terrific run of form, five wins and two draws, going into most recent four matches against Orlando City, a draw that felt like a drubbing. Then another draw with Toronto F.C. that felt like, well, a missed opportunity – actually, lots of them. Followed by a true drubbing vs. KC and, finally, a tie that felt like a win against DC, albeit where the real victory belonged to the nine remaining Revolution players against the excesses of their departed teammates. So, with 13 matches played the New England Revolution have five wins, three losses and five draws, good for second place in the East of MLS, tied for third overall but with DC having a game in hand and NYRB two. Many observers noted that the early season schedule has significantly favored Kraft F.C. with respect to travel, multiplicity of matches, injuries, suspensions, refereeing and quality of opposition. While that all may be open to debate the fact is, going forward, things are going to get tougher and the humidity in Orlando and profligacy in front of goal in Foxborough, kamikaze defending against KC and bad, to quote Paul Mariner, “stupid,” (in the case of Nguyen) red cards against DC are only the beginning. Take, for example, the significant number of players that may be missing in mid-summer what with the Gold Cup, injuries and suspensions and, possibly, transfers. While thus far the 2015 Revs have a reasonable to good record, they need to build on that start before the anticipated summer swoon. What drives this thinking is that like Gaul, the MLS season can be divided into three parts, with the postseason, if attained, constituting a fourth. The first third is often somewhere between getting acquainted and working out the kinks. Teams rarely hit the ground running, partially because of an overlong close season save for the MLS Cup participants, equally because of the normal shifts in rosters in a league where one or two key players can make a huge difference in the way a team plays. Then, in the middle of the season the hot weather hits, the length of travel starts to take a toll, new blood arrives in the summer transfer window and various tournaments rob teams of top players. Often, there are dramatic swoons (as witness the 2014 Revs), sometimes teams go on a run, either from suddenly gelling (a terrible term), or adding a key operative or two through transfers or discovery as with the Revs in the latter third with the addition of JJ. And finally, there is the fall, where the play gets sharper and more intense as the temperature and number of games left both start to drop, along with the first-year players who tend to run out of gas. In the past two seasons Jay Heap’s charges have charged straight to the finish line, coming together at precisely the right time to qualify for the post-season and then enter that fraught fray in good shape. It may not work quite so well this time around. With the MLS season at the one-third pole it is pretty clear that the Revolution are one of the better teams but that said there are any number of flaws and problems that have surfaced during the first part of the campaign. For one thing, there is the defense. The arrival in 2013 of Jose Goncalves in the middle and Andrew Farrell on the right solidified what had been a wobbly situation since the departure of Michael Parkhurst and that duo led the team into their first playoff appearance since 2009. 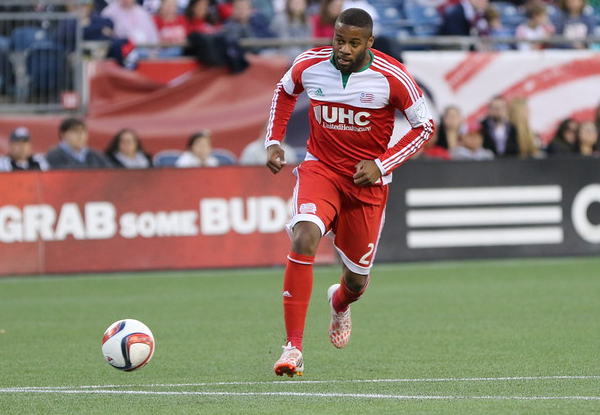 In 2014 Goncalves went into a contract pout for over half the season but recovered his equilibrium in time to help the team advance to the MLS Cup Championship Match. And now we are in 2015, indeed well into it and the Portuguese defender seems to be back in form, albeit with niggling injuries and Farrell, well, who’d a thunk it after the first few games but now, especially after last night, it is hard to imagine that Coach K might be thinking of inviting the third year player as a centerback to the Gold Cup camp. One way or another Jurgen Klinsmann is going to have a lot of influence on New England’s 2015 season. With the injury to Altidore at forward, the loss of top form by Besler and Gonzalez in central defense, and the spotty creative and pressing play of some of the midfield it just might be that Agudelo, Farrell, Jones, Nguyen, perhaps even Charlie Davies could play a part of the month-long tournament (camp included) which would certainly gut the Revs for the month of July. During those dog days New England, has four league matches, three of which are on the road, plus a game on the 27th of June by which time the pre-tournament camp should be in full swing. With the vaunted Revolution depth now shown to be somewhat illusory, Coach Heaps and his staff need to do some planning and get some cover signed up ASAP. The loss of Darrius Barnes is a useful marker to measure the quality of cover at the back. With the emergence of Woodberry, a starting back four of the 24-year-old and Chris Tierney on the outside with Farrell and Goncalves in the middle is fairly sound; good in the air and, for the first time in memory, fairly good going forward. Over the past few years, Barnes has stepped in effectively when other players have gone down. As a seasoned professional, he seems to have evolved into the kind of dependable player who can perform well for a few games but eventually gets found out. This is not a knock on the affable Duke graduate; his value to the team is considerable as witness his performances over the past two playoff seasons. It may be that the same appraisal applies to Kevin Alston, who was awful against KC, but more than credible when brought in under far more difficult circumstances against United. But as of this writing, the backups are Alston and the former Toronto FC man, Jeremy Hall, who has played the full 90 minutes in one game thus far. Both Alston and Hall are outside backs, Barnes was the cover in the center and now there is only the Great Experiment, Jermaine Jones, courtesy of Jurgen Klinsmann who completely crashed and burned against Sporting KC. Everything that makes JJ a great player in the middle third of the park conspires to make him a disaster in the back. When on song, as he was for ninety-five minutes against DC, he dominates the game, racing about like a thoroughbred amongst dray horses, taking chances, tackling with abandon, pinging cross-field passes and appearing to give up his body at every opportunity. All this works devastingly well in the relatively open play between the 18-yard boxes. Note that Jones often attacks the ball both on the ground and in the air with a significant run-up towards the intended target. In that regard, he is almost always on the front foot although frequently at the last nano-second. When he applies the same tactics in the confines of the two defensive boxes, there simply isn’t the space for him to be as effective. In man-marking he is constantly on the back foot, regularly beaten both on the ground and in the air by forwards who have the luxury of crashing into the area while he is forced to react while retreating. The six-yard box is the MLS version of being in the paint in the NBA, and with the game either on the ground or above the bar, it requires a defender to somehow always be on the front foot and attacking the ball on the ground or in the air. It may be that Jones, with all his football acumen and experience, can learn the position. But at this point, he needs to watch Andrew Farrell videos; again, who’d a thunk it? To watch JJ vids in slow motion, courtesy of replay, is witness a balletic conjuring where the impact of constant contact is calculated to the millimeter for a fascinating combination of apparent mayhem with minimal actual harm. This takes a degree of body control that, on the face of it, is at odds with his pell-mell playing style. However, it is probably the reason that he is able to play like a 28-year-old with 33 years and counting on the tires. It requires a degree of fitness and athleticism that likely won’t see out the three-year contract extension that Jones wants. All the braintrust need do is remember the rapid decline of Shalrie Joseph who, in his pomp, was every bit as dominant in the middle of the park. The difference between the Grenadian and the German may be that number 21 didn’t have the same agility in sidestepping collisions and beat up his body more quickly. If New England does re-up number 13, they will be taking a significant gamble that could come back to bite them. But, regardless of what is decided in that regard, the fact is New England needs to invest in another central defender if the ownership has any ambition to go the distance, deep into the playoffs. Both the Argentine and Colombian could play their football in a phone booth and when their legs gave out they just about did and even so, right until the end, the angels continued to sing. Lee Nguyen’s legs have hardly given out, if anything he is the ultimate Energizer Bunny as he scampers around box-to-box and touchline-to-touchline. However, it is when he is trapped between players bent on the ball as well as a bit of ancillary mayhem that the similarity to the two past masters becomes evident. What Nguyen can do with the ball at his feet is worth the price of admission, period, no matter how many or few goals he might score. Taking only their club careers into account Carlos Valderrama played from 1981 to 2002, making 619 club appearances in Colombia, Spain and MLS and scoring 54 goals. Juan Roman Riquelme played top-flight football in Argentina and Spain from 1996 to 2014, making 495 appearances and scoring 123 goals. Lee Nguyen has played professionally since 2005 making a total of 165 appearances, scoring 42 goals. A more telling statistic, given that his early career he altered between being buried on the bench at PSV, not scoring in Denmark and then being a star in Vietnam, would be that in 103 appearances for the Revs he has scored 28 times over three seasons, specifically 5, then 4 and last season, 18 goals. In the position that Nguyen plays his importance to the team is to be a facilitator. He collects the ball in different parts of the field always with an eye to starting up another offensive thrust. Often, in the heat of the game, other players will give him the ball in a difficult situation because they are confident that he can reboot, so to speak, the attack. It is here where New England’s number 24 is invaluable. While Caldwell is an excellent pivot between defense and offense, and JJ can switch the point of attack with the best of them, only Lee Nguyen can initiate the little one-twos that are so much of the team’s style. His interchanges with Agudelo, Bunbury, Davies, Fagundez, Jones and Rowe are simply lovely and when he stops on a dime and dishes out to Tierney or Woodbury for a cross the game is on in ways we have never seen before in Foxborough. Currently, with Nguyen having scored only one goal and with two assists the Revolution are averaging 1.54 goals a game and have a +2 goal differential. Last season, with Nguyen scoring 18 goals the team averaged 1.62 goals per game for a +5 rating between goals scored and goals allowed. It is difficult to believe that Nguyen will not get goals in the run of play going forward. He sees too much of the field and is in great position much of the time. There is no question that he is receiving far more attention from defenders, who jump out of their skins to close him down, thus causing him to rush his shots or deflecting them away from the target. But with all of that the New England offense is far more effective when their number 10 who wears 24 is playing. It will be interesting to see what happens this coming week, with Nguyen suspended. There are some schools of thought that he has had his peak year and given his dissatisfaction with his contract status it might be a good thing to move him during the summer window, perhaps for a defender and then to give the reins to Diego or Rowe. Professional sports are harsh and loyalties less than longstanding. Combine that with aspirations that involve money and pride, and the Revolution top brass have a cocktail of considerations staring them in the face. And, in keeping with the mixological analogy, Jermaine Jones may be the high potency essence that powers the drink but Lee Nguyen is the straw that stirs it. Further, to return to the general analogy, everyone involved with the New England Revolution, players, coaches and management, needs to play off their respective front feet for the rest of the season for there to be any hopes of success. Jim Dow has written about the Revolution since the club's first season. He previously contributed to Revsnet.com, among other outlets. He is also an avid fan of Argentinean football.